This week, I'm introducing you to Cailee August. She's a student and extremely popular local blogger. On her site, HelloHealthyEating.com, she talks about everything from how to lose weight by not eating less but eating more (fruits, veggies, organic, and so on...Cailee herself has lost over 35 lbs by changing up her diet!) to tips for connecting with nature, relaxing, and self care. She's also very much involved with her church in the heart of the capital city. Read on to find out more about her 'RI life'. Starbucks - (You) Can’t go wrong with Starbucks! I go to the one on Thayer almost daily whenever I’m home. I also like White Electric on the West Side and Cool Beans down in Narragansett. I eat gluten and dairy free, which makes finding tasty baked goods almost impossible...Thankfully, there's Wildflower Vegan Bakery And Cafe. They make the BEST chocolate cake that’s both gluten free and vegan. YUM! Whole Foods: I’m obsessed! Being gluten and dairy free, it’s pretty challenging to go out to eat, but at Whole Foods everything is labeled with the ingredients. I go to the one in University Heights a few times a week, and am pretty sure I could drive there in my sleep. Another fav is Pho, a Vietnamese soup… there’s the best Pho shop* in Providence, right on Hope Street. *Check out Apsara, at 783 Hope Street in PVD for fantastic Vietnamese, Cambodian, Thai & Chinese. I love to shop...Leviathan Exchange in Providence is a fav - I’m friends with the owner, so I usually get first pick of all the newest arrivals. *Find Leviathan Exchange, a consignment and thrift shop with an awesome selection of women's and men's apparel, at 745 Westminister St.
Transitioning to a healthier lifestyle can be challenging and overwhelming...but it doesn't have to be! We all want to feel good (and look nice, too) but we don't want to kill ourselves trying. Here are my Top 3 Tips to make a healthier lifestyle easier and more enjoyable! 1. Ditch The "All Or Nothing" Attitude - A common misconception people have is that , in order to be healthy, you need to completely eliminate certain foods and/or food groups from your diet. Remember the days when 'low carb' diets were all the rage? Then suddenly meat was enemy #1 and everyone turned vegan. And when everyone eliminated all fats from their diets, we found out healthy fats are important. Well, I'm 'all about balance'. I eat gluten and dairy free because of food intolerances, but I truly believe that a healthy diet is balanced one. Learning to eat the foods my body does tolerate in moderation has allowed me to guiltlessly enjoy little treats daily. My fave ways to treat myself? Salted dark chocolate, dairy-free coconut ice cream and crunchy gluten free cookies! 2. Make Exercise Enjoyable - Does the idea of an afternoon at the gym sound like torture to you? Then DON'T do it! A big mistake people make when trying to live a healthier lifestyle is that they force themselves to do exercises they hate. Sure, it may work for a week or two, but unless you enjoy it, you'll never keep it up. My advice? Find an activity that you love. For me, it's walking...going for a walk clears my head, gives me energy, and helps me de-stress. Other fun activities to try - yoga, pilates, zumba, biking, hiking, and even swimming. 3. Make It A Lifestyle - Another common mistake people make is that they try to change everything overnight. Drastic measures often set you up for failure. Cleaning up your diet, following a new fitness regimen, making sure to get enough rest each night, and learning to de-stress - all while "maintaining a life" can be quite a challenge. Eventually, you give up and give in. Rather than changing very habit all at once, focus on realistic baby steps. Healthy, lasting lifestyle changes don't happen overnight.,.they take time, consistency, and effort, but the results have lasting impact. So ditch the diet and make it a lifestyle - Hello Healthy Eating! To see more from Cailee, go to her blog HelloHealthyEating.com. Click here to LIKE them on Facebook. Photo Credits: Photos of Cailee August and the DIY snack courtesy of her, her blog and her social media. 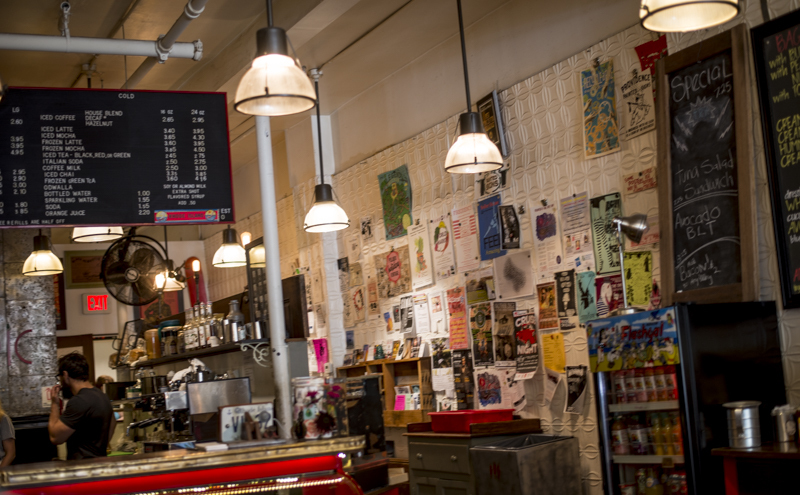 Photos of White Electric Coffee courtesy of Ashley Farney. Photos of Leviathan Clothing Exchange courtesy of YELP/Google Images. Photo of Starbucks counter and fruits courtesy of the PattyJDotCom IG account. Colt State park pic courtesy of the unofficial CSP Facebook page.